Trust Precision Engineering Ltd was founded in 2011 with an aim to quickly establish an outstanding reputation for the high quality of its output and for the excellent standards of service provided. To enable the delivery of its ambitious aspirations, company owner Nicholas Street invested heavily in what he considered to be the best available "One Hit" turning and milling machine tool. The UK’s only Citizen M32VIII, 15 Axis Sliding head machine tool with programmable B Axis capabilities, has enabled the company’s earliest objectives to be quickly achieved. The high volume of quality parts produced on the company’s impressive machine tool helped to ensure the early success of the fledgling business. Now, firmly established, the burgeoning company’s customer base and order book continues to expand. Nicholas Street explained;, “The advanced capabilities of our Citizen machine allow the manufacture of components that you may have considered are complex milling applications only, or require a secondary finishing operation. By removing the labour intensive actions of loading and unloading, that are required to run a milling machine, you not only save money, you also remove the potential for human error. “Although the manufacture of high-quality components is our absolute priority, the volume of work that our Citizen M32VIII is able to get though, enables us to supply extremely competitive quotes to our customers. “In addition to our investment in production, our commitment to quality is illustrated in our investment in a state-of-the-art, Venture 2510 CNC Vision/Probe Measuring system, from Baty International. “As with our major machine tool purchase, we felt that our choice of the most appropriate measuring technology was critical to the success of the company. Our high quality standards, allied to the volume of diverse work expected to pass through our inspection department meant that we required not only an accurate, flexible solution, but also a fast one. Having researched the available options, we chose the CNC version of the Baty Venture, optical measuring device. Baty International is one of the world's leading manufacturers of Optical Profile Projectors, Co-ordinate and Measuring Systems. Building on decades of experience in non contact dimensional measurement, Baty has offered premium quality camera based vision measuring systems since the early 1980s. Baty’s highly precise, 3 axis Venture range includes both manual and CNC systems. The use of Fusion software means that Venture CNC models are able to completely automate 3D inspection processes and accurately undertake tasks such as scanning and ‘best-fit’ extremely quickly. Venture uses a ‘teach and repeat process’, by simply measuring a part, a full CNC program is created automatically. The machine’s zoom lens can also be controlled so that magnification changes are all recorded into the created program. Increasing the Venture’s flexibility, measurements from data points taken using a touch probe can be combined with those taken using video edge detection, resulting in reduced inspection times. Venture can be supplied with a changer rack so that probe modules, fitted with a variety of pre-calibrated styli, can also be used in the same inspection routine. When a change of stylus is required, the system automatically returns the previously used probe module to the rack, then picks up the next probe module to continue the inspection process. 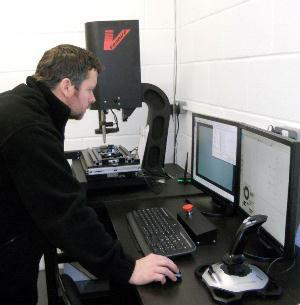 For more information on Baty's Venture 3D CNC Vision Systems click here.